In the port of Gaženica, the two Jadrolinija ferries "Sis" and "Juraj Dalmatinac" were in allision in the night of Apr 22, 2017, at 7.30 p.m. Upon the departure from Gaženica, the "Sis" suffered engine failure and continued to move towards the "Juraj Dalmatinac" which was moored at the quay, and struck it, thereby breaching the hull at starboard side with the port side of the stern ramp. The breach had a size of 60 centimeters and was 10 meters above the water line. The "Sis" did not suffer structural damagebut had to remain in port for investigations. 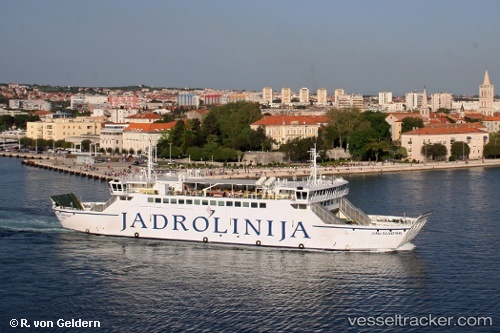 The passengers were taken over by the ferry "Vladimir Nazor". The "Juraj Dalmatinac" was repaired in a shipyard in the port of Kraljevica. She left again after repairs on Apr 26 at 11.40 a.m. and headed to Gazenica.